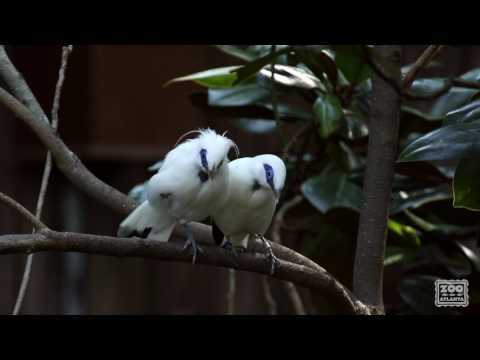 The Bali mynah’s status as a symbol of wealth and popularity within the pet trade have dramatically reduced wild populations to a very small number of birds. Bali mynahs are currently found only in a portion of the Indonesian island of Bali. Bali mynahs may be seen year-round at Zoo Atlanta, but on colder or rainier days, they may choose to spend time in their heated indoor area. Also known as the Bali starling, the Bali mynah is known for its appearance and ability to mimic sounds of other animals, including humans. These same characteristics have resulted in a conservation crisis for Bali mynahs, and the world’s remaining live Bali mynahs have been poached to a population of only around 20 birds or fewer. More than 1,000 are known to live in zoos and other breeding programs. Bali mynahs are recognized by their white plumage with black accents, drooping crests and bright-blue facial masks. Bali mynahs form monogamous pairs, usually nesting in tree holes such as those abandoned by woodpeckers. Courtship behaviors are complex and include exaggerated postures, body-bobbing and a series of vocalizations. This species apparently has always had a small natural range, including just about one-third of the island of Bali. In the wild, Bali mynahs prey on insects and forage for fruits. At the Zoo, they are offered crickets, mealworms, fruits and a commercially-prepared softbill songbird diet.